Call Plumbers R Us on 1300 758 626 to take up this special online price of $330.00 and your blocked drain worries are over! Call the Melbournes Blocked Drain Specialists and using our specialist equipment we can clear your drain for a simple payment of $330.00 no more to pay. Most blockages are often caused by root intrusions from shrubs or trees, toilet paper, foreign objects stuck in the drain. These can generally be cleared with basic water jetting, however some blockages are more diabolical and can be caused by large tree roots or worse collapsed pipes. In this instance you will require further work , we will refund you $330.00* for failing to clear the obstruction and quote you for any further work required to solve your problem in the most cost effective and efficient manner. Our plumbing crew of plumbers has the skills, knowledge and expertise backed up by a range of specialised plant and equipment that give us the ability to handle any problem you may be experiencing with your drains. With our many decades of local knowledge and long term relationships with associated partners you can be sure that there is no drainage problem associated with blocked drains that our team canâ€™t handle. We offer complete drain repair and maintenance services for blocked sewers and storm water systems whether it be domestic, industrial or commercial. If you have a blocked drain or worse toilet, your best option is to call our team of specialised plumbers, we are fully equipped to fix most problems on the spot, we provide an emergency, rapid response service and get the job done. Plumbers R Us team specialise in drainage maintenance and rehabilitation. The following is a list of common problems our Plumbers find in homes and businesses that are associated with blocked sewer and blocked storm water lines. Damaged pipes due to shifting soil, tree root intrusion, settling, building or landscaping works. We can diagnose your blocked drain and locate problems without having to excavate. Grease build up, tree root intrusion or foreign object is restricting or prohibiting proper flow. We provide sewer cleaning services for blocked sewers pipes. Pipes have deteriorated, causing collapses in the line and restricting or blocking proper flow. We have the technology to deal with damaged underground drainage systems. Pipes have sunk due to ground or soil conditions, creating a valley that collects paper and waste. We are experienced drainage excavation professionals with specialised excavation equipment. Seals between pipes have broken or perished, allowing waste water to escape into the ground. We can diagnose, locate and repair underground drainage lines without having to excavate using pipe lining technology. Tree or shrub roots have invaded the sewer line through existing pipe defects causing a blocked drain. 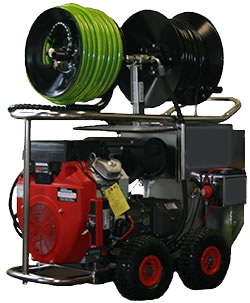 We use powerful drain cleaning machines to remove tree root intrusions to unblock drains for blocked sewer drains.